Palominos in Texas. I remember riding his horses as a very small child and the joy it gave me. horses to take care of and ride. Bachelor of Fine Arts degree in 1969. For many years I had been enamored with all things British. Olva moved to England? Have you heard of Dorothy Dunnett? "green card" so I finally returned to Texas inspired and tested. Council, Windy Knoll Farm show, Pine Hill Farm's original logo and more. CLICK HERE to see more of my logo designs. the race track. He was a 3-year-old and 3 months gelded. a few) we went to a lot of shows and won a lot of ribbons. Olva and Calaveras County, aka: "Splash"
between the activities and no way of knowing what was going on right around the corner. clinics in Texas, Oklahoma, Louisiana & New Mexico. from Arizona to Florida. But bad times in the "oil patch" were coming. 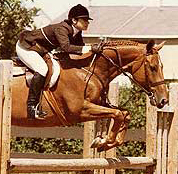 photography and journalism and the horse show scene. 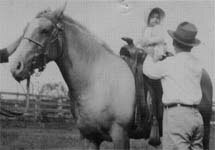 Texas Horseman's Directory, that I still publish online. 2010 marked its 30th Anniversary. 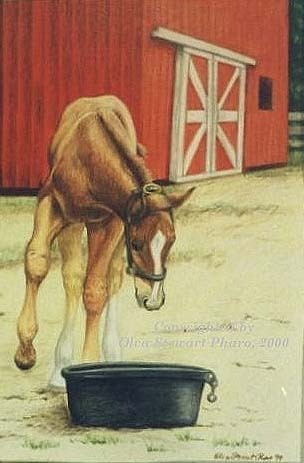 You can find the Texas Horseman's Directory online at: www.texashorsemansdirectory.com. 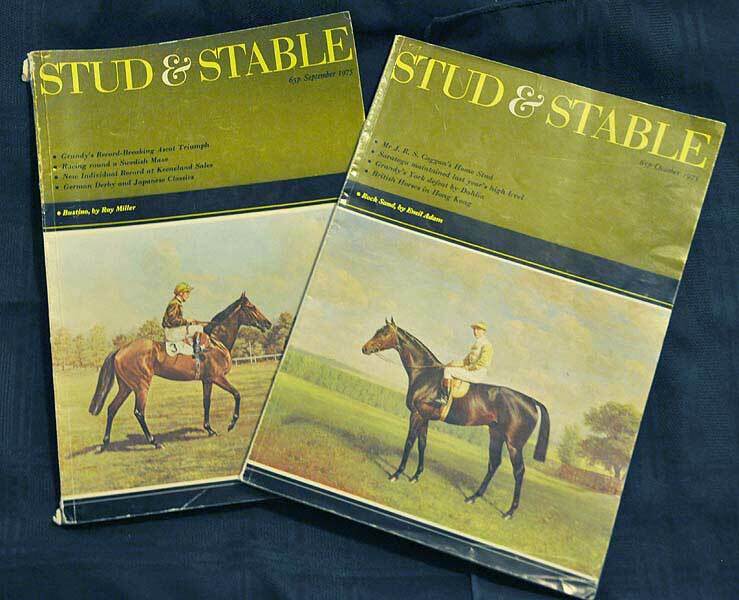 shows and events for The Chronicle of the Horse, Dressage & CT, Horseman, HorsePlay, The Horse Digest and Horse Illustrated. 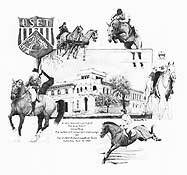 In 1986 the first titled Olympic Festival was held in Houston with the equestrian events at the Great Southwest Equestrian Center, Katy. My report was published by The Horse Digest. magazine in the U.S. It was published in Houston, Texas, by Scripps Howard Publishing Co.
Texas. Got to cover the Quarter Horse Congress and do three (3) really nice cover photo shoots. When Scripps sold the magazine and a new editor took over I decided it was time to go. still in competition. A competitor walked up to the drawing and said, "Is that Adelssohn?" "Can you draw my horse?" My dear friend, Betty Chesnin Freideau spoke up, "Yes, she can!" 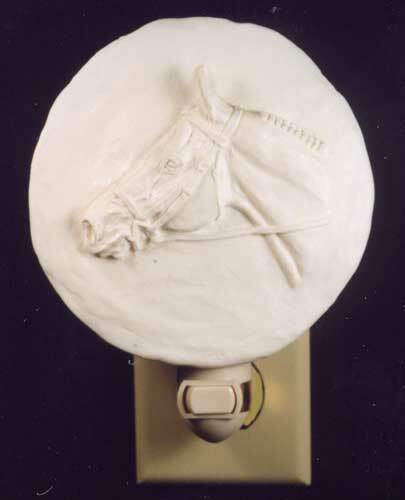 Prix horse drawing, "A Kind Eye", became my logo. representatives of the 5 major Olympic eauestrian events. in Kingsville. It was purchased by a member of the King Ranch family and resides at the ranch. proud to be a Texan. to old Breyer Horses by painting and reshaping them to new and various designs. Assyrian and Ancient Greek themes. I even offer custom portraits on Breyer Horses. the kind words in an email or letter make the challenge all worth while. 6 months and took my energy away. Dressage At Devon for the "Born In The USA"
Gathering and the National Reining Breeder Cup. of his estate. My life became a series of lawyers, accoutants, bankers and real estate agents. I did not make it to any 2010 fall shows. Pin Oak, The Spring Gathering, NRBC and the Houston Dressage Society Spring Shows. Pin Oak and The Spring Gathering. Being completely stressed out I had to take some time off. in 2011 was Steffen Peters on Ravel. 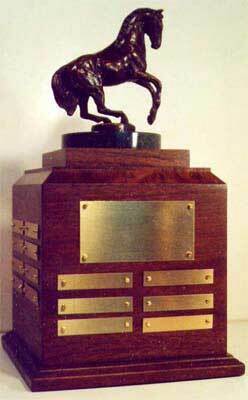 But the actual bronze trophy was not be ready in time. It would not be ready until 2012.
forget all that was going on at home for a few days. With 3 estates to settle and 3 houses to sell, life became complicated. Beaumont, owners of the A Winter's Tale star, Listo. Jennifer Alfano, who commissioned his bronze portrait. 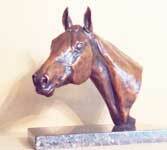 See Jersey Boy's bronze portrait. riding center of your choice. See more about this sculpture here. For more information about SIRE click here. on to "horse & rider". of my uncle. In 2013 it was finally finished. I call it: "Can I Come, Too!". who put me on her. sculpture that I did and wanted it. It is now cast. #1 delivered. #2 of a limited edition of 10 is now available for sale. See Bronze. 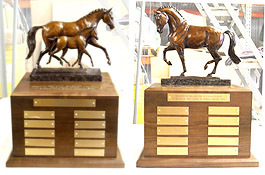 head-to-head championship since the creation of USDF Regional Finals. Adult Amateur Grand Prix Musical Freestyle. Adult Amateur Champion was born. Friday, November 7, 2014 at the US Dressage Finals in Lexington, KY.
FL, riding her PRE gelding, Junior. Jennifer Alfano. Candid was a lovely and cooperative model. Jonathan, to honor Para-Equestrian competitors. Nov. 29, 2015 at the US Para-Equestrian Championships in Katy, TX. level of competition in Dressage, Driving, Reining or Vaulting. London where he was the highest placed American competitor barely missing the Bronze Medal. Sadly, Jonathan died on September 30, 2012. (18" x 24") "Peter Pletcher and Uncle Sam", now in private collection. 18" x 24", auctioned at this gala fund raiser at the King Ranch in Kingsville. It was bought by a member of the King Ranch family and resides at the ranch. 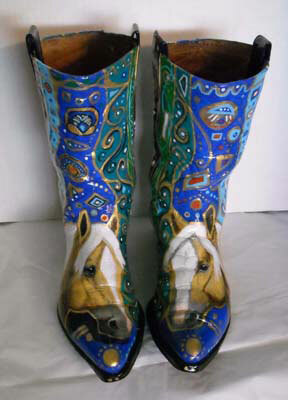 donated to SIRE Therapeutic Riding to honor the dedicated volunteers. Sales of prints and note cards still benefit S.I.R.E. Original drawing in private collection. "The Chronicle of the Horse"
* 1998 - commissioned to do the cover art for the 51st Pin Oak Charity Horse Show, program, colored pencil drawing of past POCHS champions, 18" x 24". The design was used for prints, posters and t-shirts. 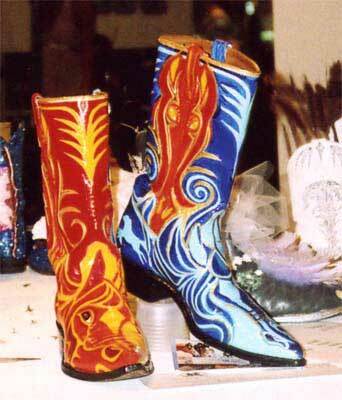 A portion of the proceeds benefited the Ronald McDonald House of Houston. 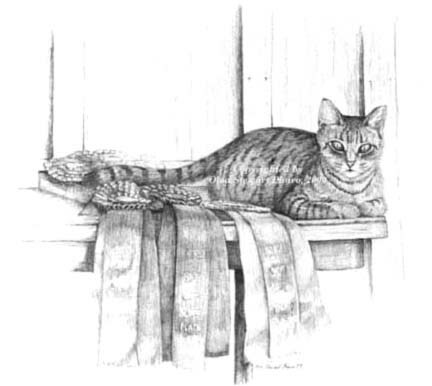 * 1999 - drawing "Ribbon Guard", appeared on the cover of "The Chronicle of the Horse" one of the few cats to ever appear on a Chronicle cover. 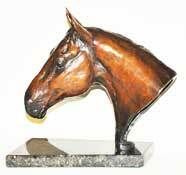 * 2000 - commissioned to create a trophy for the Texas Dressage Classic, held annually at Las Colinas Equestrian Center in Irving, TX. 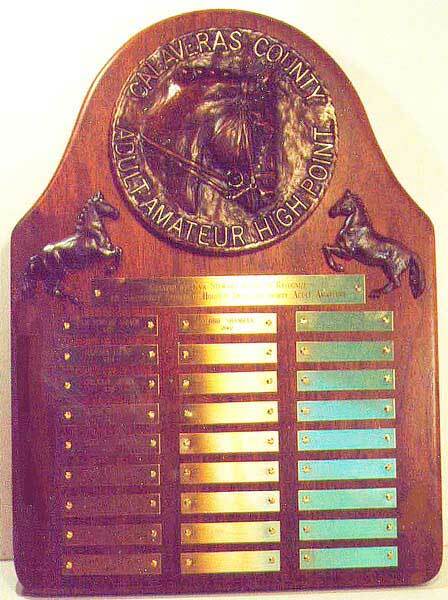 It is awarded annually to the high point amateur at the show. 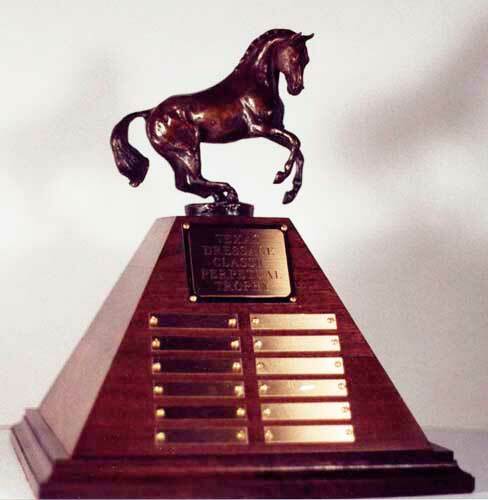 The first award was given April 29, 2001. 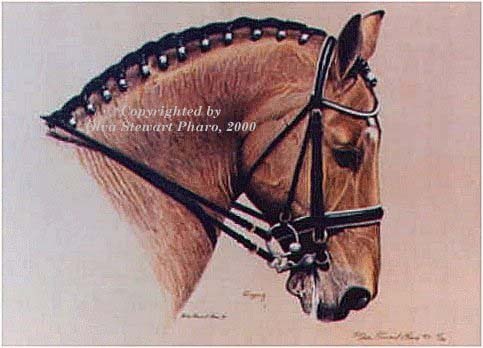 * 2000 - drawings featured on the cover of the "Lone Star Horse Report", the portrait of "Gigong, the Elite Hanoverian Stallion". 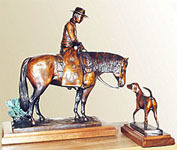 * 2000 - "Gigong's" portrait along with a portrait bronze of "Pintus, an Irish Hunter" appeared in an article on equine artists in "Horse Illustrated". 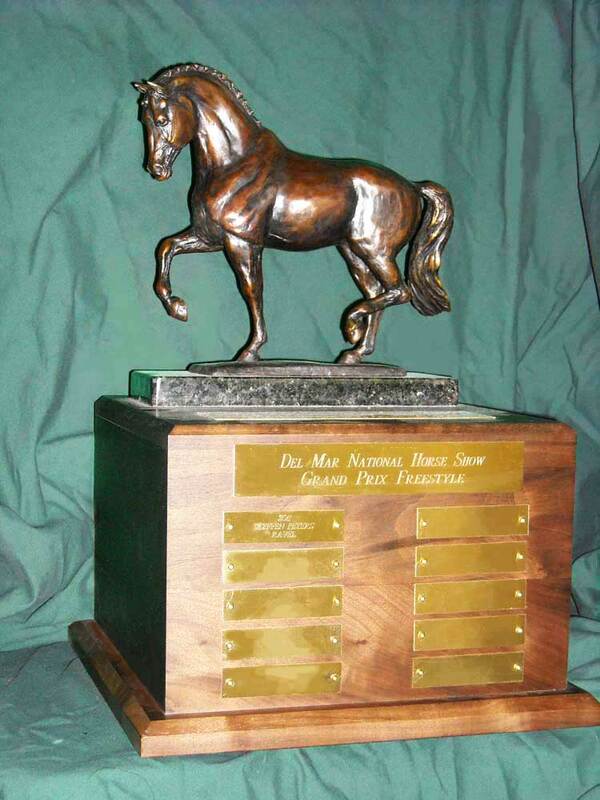 * 2002 - commissioned by Positive Step Farm to create a perpetual trophy for the Detroit Dressage Society, Detroit, MI. 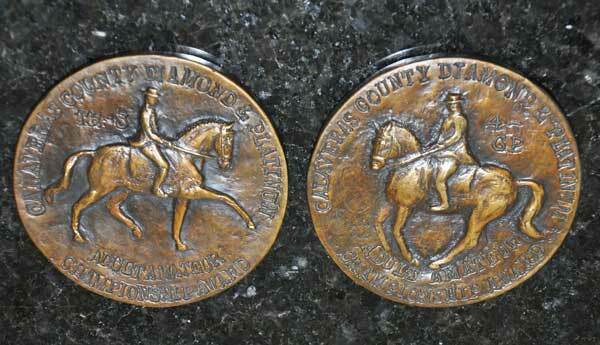 Awarded annually with plaques. 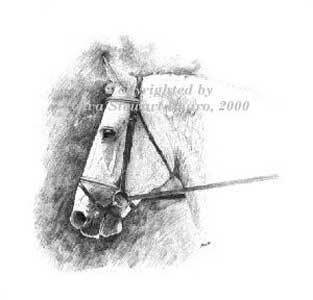 * 2003 - drawing called "A Colt, a Bucket and a Big Red Barn" appears on the cover of "Lone Star Horse Report". 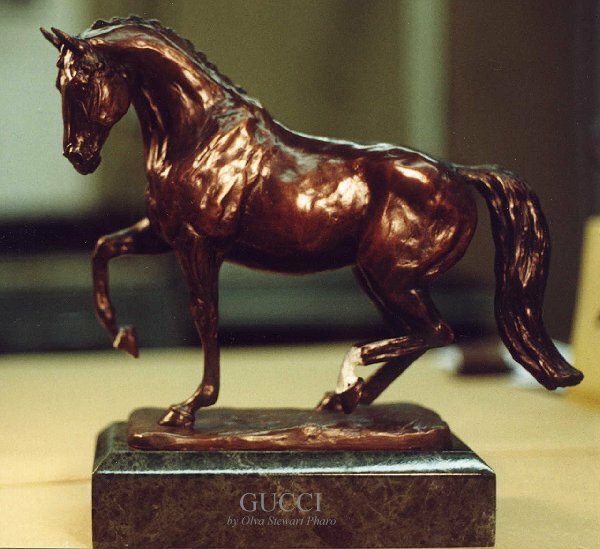 * 2003 - "Gucci", a bronze portrait of Canaan Ranch's champion dressage gelding, was awarded the Equine Visions Choice Award for sculpture in the Equine Art Guild's Annual Show and was featured in Equine Visions Magazine (now called "Horses in Art"). 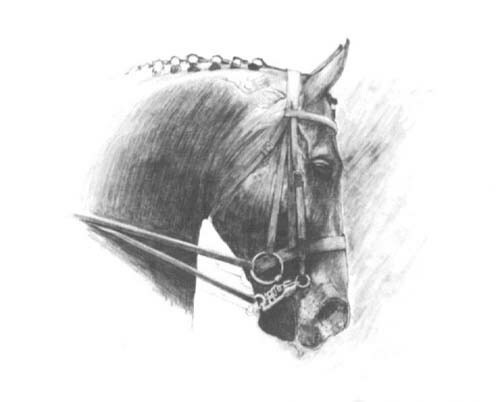 * 2004 - commissioned portrait of Jennifer Price's horses appeared in an article on equine artists in Horse Illustrated showing how such a drawing of two horses together was created. 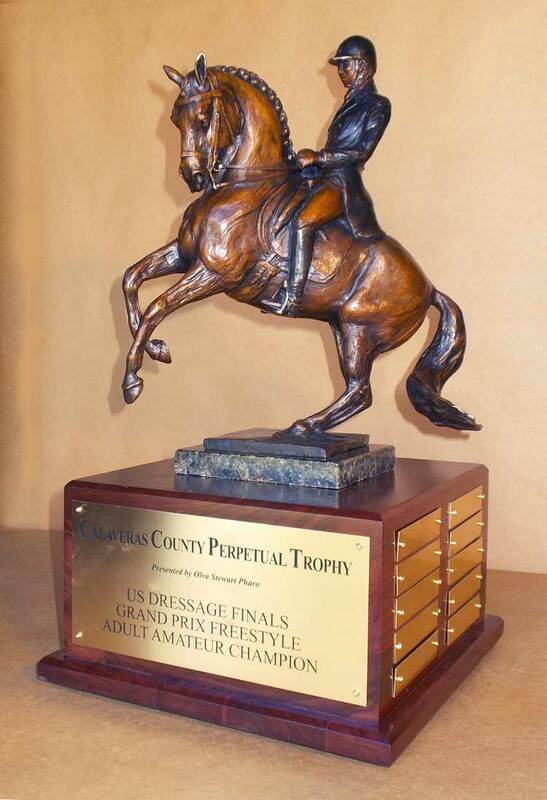 * 2005 - created the "Calaveras County Perpetual Trophy" for the Annual Pin Oak Charity Horse Show. 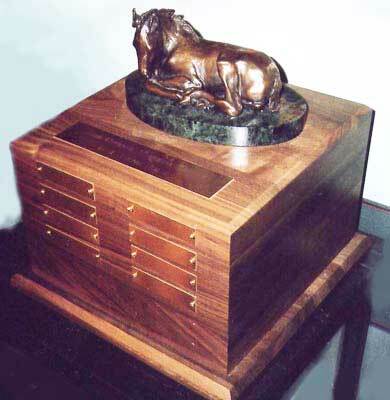 In 2005 and 2006 awarded to the winner of the $5000 Adult/Junior Gamblers Choice. 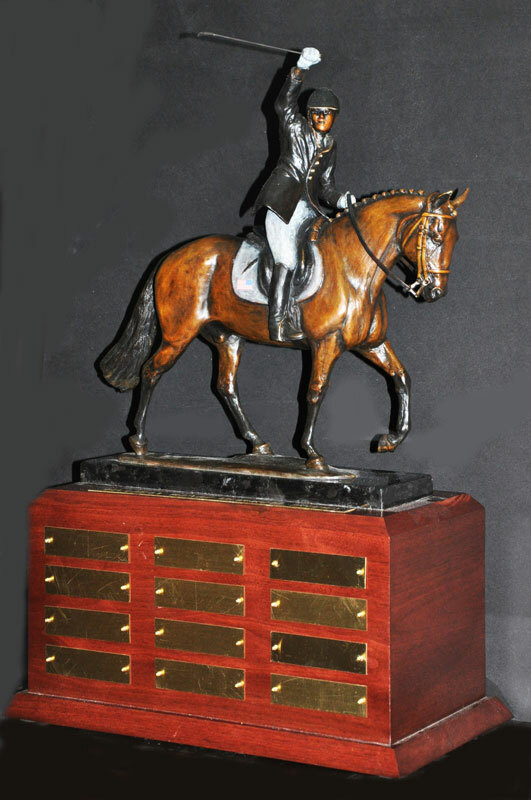 Since 2007 it has been awarded to the winner of the $20,000 Children's/Adult Jumper Classic. 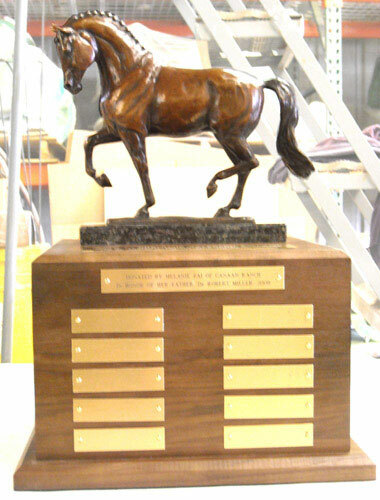 * 2005 - Reserve Champion Adult Division, "Tricked Out Pony Contest", 50% of proceeds to animal shelter groups, contest to make a Peter Stone model horse into a "Tricked Out Pony". 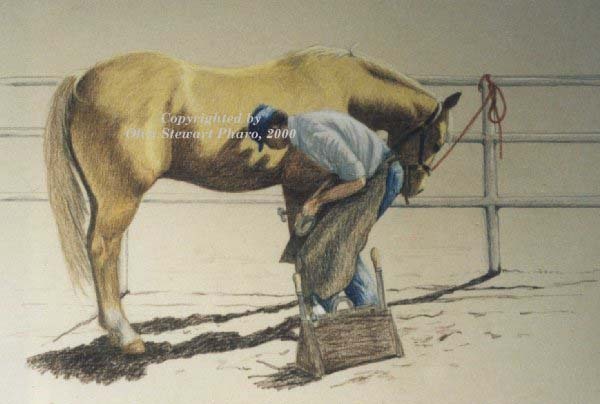 * 2005 - colored pencil drawing "Farrier's First Horse" appeared in December, 2005, EQUUS magazine as an illustration for an article on new horse owners. * 2008 - Dressage At Devon Born in the U.S.A. 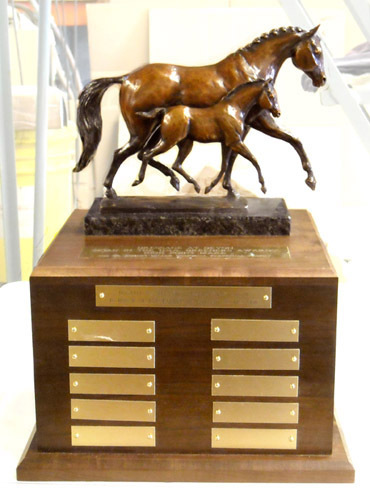 Breeders Award High Point Stallion Trophy, Dr. Robert Miller Perpetual Trophy & Dressage At Devon Born in the U.S.A. 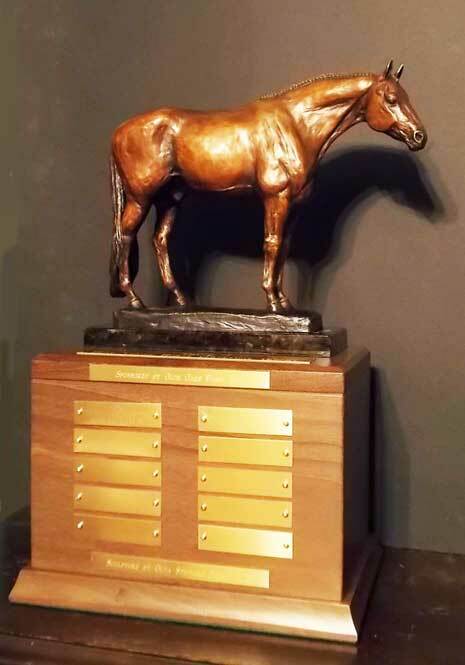 Breeders Award High Point Mare Trophy, Dr. Robert Miller Perpetual Trophy commissioned by Melanie Pai of Canaan Ranch. * 2009 - drawing called <"White Horse on Klimt" appears on the cover of the May issue of "Lone Star Horse Report". 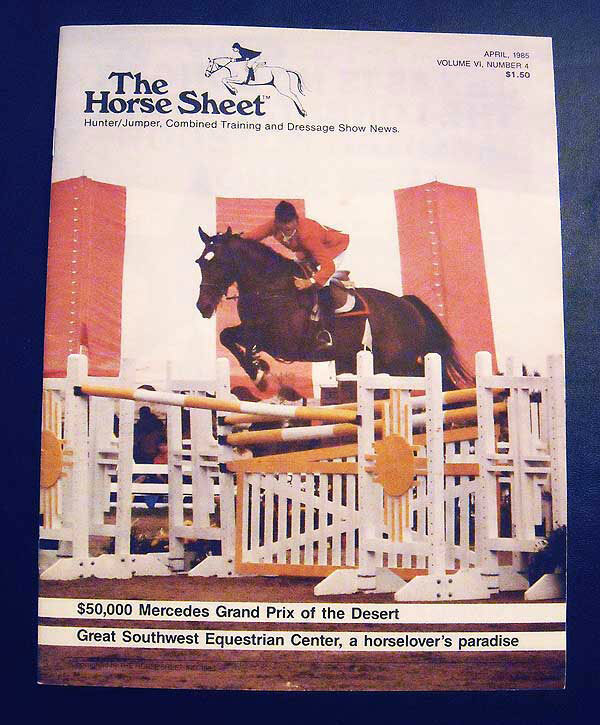 * 2010 April - cover art of "The Exhibitor", the official publication of Great Southwest Equestrian Center, portrait of Jerry Kimmel's Champion Reining Stallion, Dun Gotta Gun. * 2014 - A BOND BEYOND, a bronze sculpture dedicated to SIRE Therapeutic Riding Centers of Houston, TX - donated to the 2014 SIRE GALA, Live Auction, May 3, 2014. 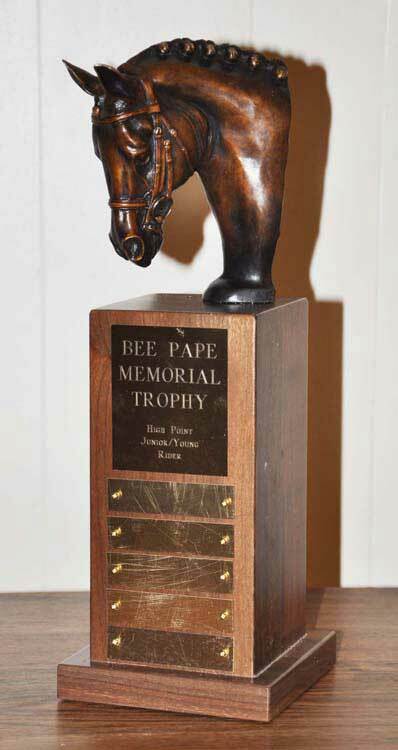 * 2016 - Oklahoma Dressage Society, Bee Pape Memorial Trophy for High Point Junior/Young Rider presented at the ODS Spring Dressage Show, May 7. Saying "Goodbye" to a friend. . . . .
dressage shows, driving events, pony club rallies and twice a year a USEA recognized event. Farm in its infancy. I saw it grow from a weekend project into a way of life. Phil became a friend and Pine Hill a constant destination for horse shows. 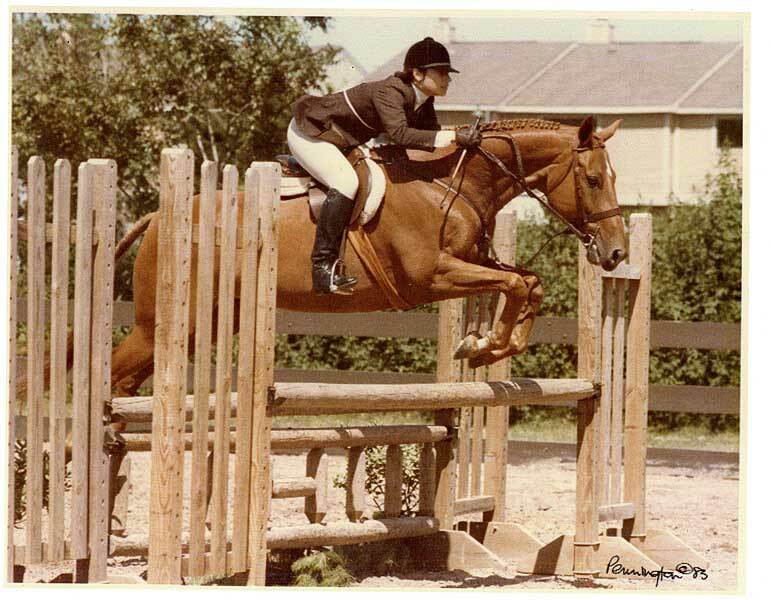 I competed in hunter/jumper shows at Pine Hill in the 80s. I was once unceremoniously rubbed off on one of those beautiful pine tree limbs by my high spirited Calaveras County. 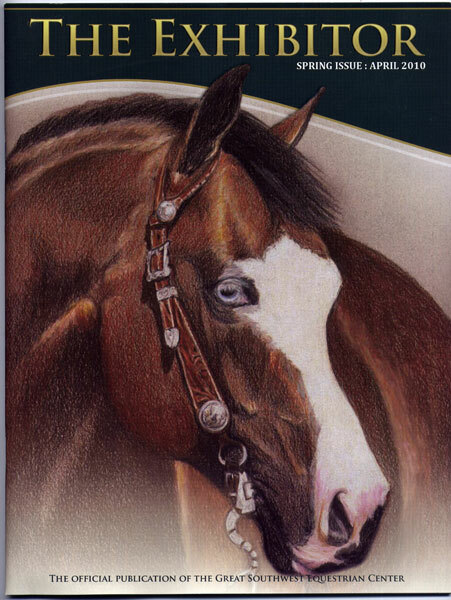 It was at a Houston Dressage Society show in 1994 that my career as an equine portrait artist began. 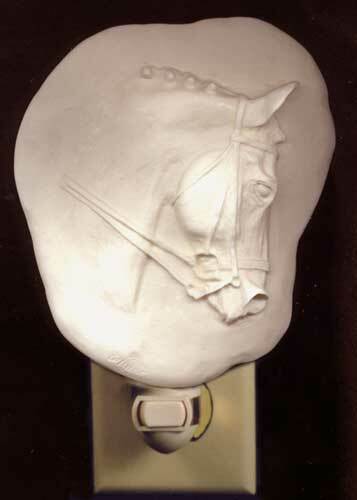 The year before I had created a high point award for the Houston Dressage Society with a print of a idealized dressage horse head (now my logo) as the award. 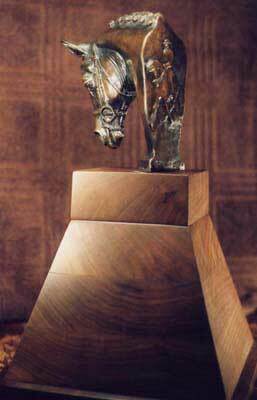 In 1994 I used a photograph of Hans Boone's stallion, Adelssohn, as the model for the first Calaveras County Adult Amateur High Point Award. The award was a framed print of my pencil portrait of Adelssohn and was displayed at my booth. A competitor walked up and said, "Is that Adelssohn?" The likeness was strong enough that she recognized him. Then she asked, "Can you do my horse?" The rest is history. I made 6 portraits at this competitor's barn and my new career grew from there. 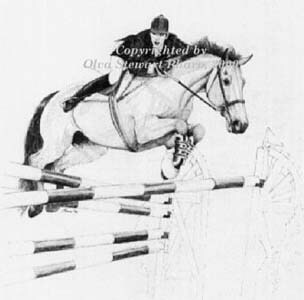 If I had not made the portrait from a photograph I took at a dressage show at Pine Hill and if I had not had a booth at the HDS show at Pine Hill, Equestrian Portraits may never had gotten started. I designed Phil's Pine Hill Farm logo using one of the large pine cones from those beautiful trees as a model. 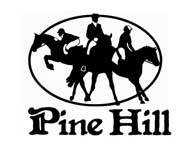 In the Fall of 2010 Phil asked me to design a new sign for Pine Hill to go on his barn. It was to be cut out of metal. You can see it on the Pine HIll website. Pine Hill was always a fun place to go to. Phil always made everyone feel at home. He was like my second older brother, the one who loved horses. I had no idea how close that was. My brother was born on August 8, 1942 just 2-1/2 months before Phil. My brother died June 21, 2010. He never liked horses. My life took another path and I stopped showing and did not visit Pine Hill much but whenever Phil saw me at a show at Great Southwest he was always ready with a grin and a hug. I was so happy he found Ruth to share his passion and had Ellie. He had a wonderful life and will be long remembered for what he did for the horse community and his fellow horse lovers. A memorial fund has been set up to assist in maintaining Phil's legacy of Pine Hill Farm. To contribute send a check payable to: "Phil Sawin Memorial Trust Fund" and mail it to: Sterling Bank, Phil Sawin Memorial Trust Fund, 15000 Northwest Freeway, Houston, TX 77040. Please enclose a note with the check as to the fund you wish to contribute to.